How to Visit by Boat or Bus, Car or Hiking. Beautiful describes the town of Portovenere - so does stately and evocative and discreet. This jewel of Liguria is located on the western shore of the Gulf of La Spezia - just 6 miles south (by air) from Riomaggiore, the southernmost village of the Cinque Terre. This article will help you get to Porto Venere* and for information on What to Eat and selecting a Portovenere hotel, scroll way down. For information on what to see, read Portovenere Travel Guide - The Top Ten Attractions and you also might like La Spezia Travel Guide - 10 Top Attractions. Hiking To Portovenere & Cinque Terre. There is no train to Portovenere. The closest train connections are La Spezia Centrale and four of the Cinque Terre towns (not Corniglia). At La Spezia the transfer is by bus, taxi, or ferry boat. From the Cinque Terre the transfer is by a ferry boat so weather, budget, & baggage are considerations. ATC bus line 11/P runs between La Spezia and Portovenere. It's easy to take the bus from La Spezia to Portovenere. 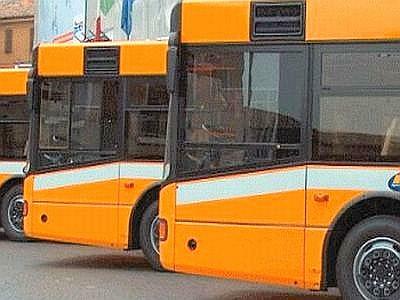 The excellent bus service to and from La Spezia is the 11/P bus line which runs along the shore road (SS530) to Portovenere, leaving about every 15 minutes all day long (but not from the train station). From La Spezia, the trip takes about 35 minutes, and it's a codice 3 ticket. One main bus stop is Mercato Nord which is just north of La Spezia's open market on Corso Cavour (La Spezia Map: Train-Bus Transfer). There are also other outbound bus stops, of course (one's near the soccer stadium) and they are found by means of the blue bus icons on the map referenced above. If you click the bus icon, a box appears with the stop's bus lines and times. You can read more about taking buses and free and pay parking in our article Getting Around: La Spezia. The Mercato Nord bus stop is a pleasant 10 minute walk from La Spezia Centrale train station. La Spezia, Mercato Nord bus stop. Ticket Sellers. Tickets are sold at most newstands and tobacconists, all post offices, some bars and stores. In La Spezia, the easiest for many will be the Centrale FS train station, where there's a self-service bus ticket machine. From the Mercato Nord bus stop, there's a newstand at the outdoor market nearby. In Portovenere, tickets are sold at the Tourist Office (Pro Loco) near the entrance to the old town. There's also a self-service machine on the municipio (city hall) side of Via Garibaldi near the main bus stop - opposite the fruit store. If you buy from the bus driver, the price is doubled. From Sarzana, The bus from Sarzana to Portovenere requires a codice 7 ticket, and the bus leaves from Piazza Martiri, which is located near the center. Ask locally for directions. The bus leaves hourly and it takes about 70 minutes. On your return, make sure you get the Sarzana bus from Portovenere, since after reaching La Spezia each bus travels to a different destination. Consider also a train between Sarzana and La Spezia, and then the La Spezia-Portovenere bus. For more detailed bus planning, see the ATC Website - where you can get a full or partial timetable and bus and parking info. There's also an ATC Trip Planner which will determine the route from your desired origin and destination and display it on a map. Remember that the schedules do not mention every bus stop, and the map icon info may not mention every bus stopping there. The schedules change around June 14 and September 15, though usually not significantly. Part 1 Liguria Hotel Guide & City Selector Portovenere Hotels also Listed Below. Ferry boat trip to Cinque Terre from Portovenere. It's easy to reach to Portovenere by boat. The most realistic departure ports are La Spezia, Lerici, and four of the Cinque Terre towns (not Corniglia). While there's one RT daily from Levanto, locals recommend the train to Riomaggiore and then a boat from there. Boat service begins around the end of March and ends after the 1st weekend of November. There are more trips on weekends and holidays, and in July and August. 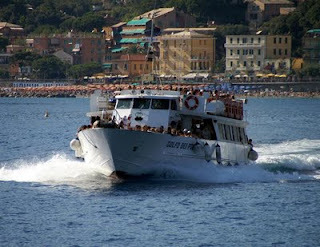 Look at our articles which have complete schedules, prices & info, Cinque Terre, Lerici, Portovenere Boat / Ferry Schedules. Verify schedules before your trip if your timing is tight. Keep in mind that the boats can be canceled for rough weather (which is uncommon in summer). In La Spezia, the boats leave from the western end of the Passeggiata Morin, which is the promenade along the waterfront, a 15-20 minute walk from the Centrale train station. There's lots of pay parking at nearby Porto Mirabello with pedestrian access over a cute suspension bridge to the ferry docks. Access to Porto Mirabello is from the roundabout where Via Italia meets Viale Amendola just west of the waterfront. In Lerici, the dock is at the castle end of town, on one side of Piazza Garibaldi. In Portovenere, the dock is where the auto road nears the waterfront at the edge of the old town. As befits a maritime community, you can arrange for affordable charter boat service for transport to or from Portovenere, as well as for tours, weddings, or facilitating unique hikes. This is an especially useful option if you have a group. The Consorzio Barcaioli is the local cooperative which has a price page (quoted per person with a 4 passenger minimum). Portovenere Taxi Boat is a small local charter and rental boat service. We advise getting your car from one of the companies with the fewest problems reported (Avis, Europcar, Hertz, Autovia, Budget) either direct or via a reputable car rental broker such as AutoEuropewhere you get added services without paying more - 24/7 help line before, during, and after the rental; easy changes and cancellation; as well as available less expensive zero excess (deductible) insurance. ** We hope you'll make your reservation through these links -using the links do not raise your price. Driving to Portovenere. Driving your car rental to Portovenere through La Spezia is easy! The A15 autostrada exit becomes Via Carducci. Proceed straight about 2 km, and turn left, as directed by the blue Portovenere sign, onto Via Italia which is also SS1 (a/k/a the Roman Via Aurelia!). Proceed straight for about 2 km past La Spezia's lovely waterfront with its walkway, the Passeggiata Morin. The road will take a sharp right turn and then you're continuing straight as the road changes name to Viale Amendola. After about 1 km, turn left at a traffic light onto Viale Fieschi which is also SS530 following the blue sign to Portovenere and Cinque Terre. After another kilometer, at a giant intersection, you'll make a dull left turn toward Portovenere continuing on SS530. The road to Cinque Terre will be forking to the right on SS370. From here, the SS530 takes you to Portovenere without any serious decisions. You'll see some military installations; skirt the small seaside frazioni of Marola, Fezzano, and Le Grazie; be treated to some nice views of the Gulf; and after about 12 km and 20 minutes, you'll be there. Parking in Portovenere Driving in Portovenere is even easier because there are no choices: there's just one one-way loop through town. There's also no decision regarding free parking - there isn't any: you must pay from 8am to 9pm from March 15 to October 15, or to 7 pm in low season. In early 2015, the high season hourly rates were listed to be Zone 1- 2.50E, Zone 2- 2.00E, Zone 3 & outlying Cavo- 1.50E. It would be more in the one underground garage in the town center. The outlying pay parking lots ('Cavo zone') can be reached by a shuttle bus on weekends (April to Oct.) and daily in July and August. The parking receipt to display on your dashboard is issued by a machine and the ones we saw accepted coins and bills. Allow 2-3 hours for a simple tour of old Portovenere, 4-5 hours for a leisurely exploration with drinks or for a simple hike around the island of Palmaria. The complete parking fee schedule and a map is here: Portovenere Parking Rates. If you're staying for more than 7 hours, investigate the town's daily rate. For a more an extended time, talk to your hotel, investigate the town's weekend or weekly rate, consider leaving the car in one of the free lots in La Spezia, or consider parking near one of the towns along the shore road (SS530) and taking the bus the rest of the way. 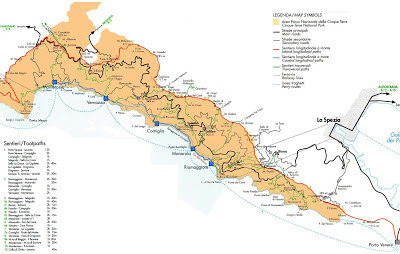 See our article Getting Around: La Spezia which has information and links on parking in La Spezia. For a taxi to Portovenere from La Spezia, there's Radio Taxi La Spezia phone 0187 523 523. The fare in early 2013 was listed as 35€. There may be small extra charges for luggage and extra passengers. In Italy, taxi drivers do not expect a tip. For a taxi in Portovenere, the pro loco lists Daniele at 346.1573636. The Portovenere Promontory from near Campiglia on CAI trail 1, Sentiero del Crinale ( the Ridge Trail). Click to enlarge. F to R: The peak Il Muzzerone, Byron's Grotto, the rock spur of San Pietro (note steeple), Palmaria Island, Tino Island. Portovenere is the endpoint (or beginning) of one of Italy's most scenic trails - CAI 1, Portovenere to Levanto, also known as the Sentiero del Crinale (the ridge trail). It's a serious trail that runs through mountainous terrain, but it's not crazy steep or unusually dangerous. If you are starting a hike from Portovenere, the trail begins off the main piazza outside the old town, and climbs alongside the town wall. Trail 1 at Portovenere's town wall. For hiking to Portovenere, there are several starting points besides Levanto. You can reach Trail 1 from all the Cinque Terre villages via connecting trails. Trail 1 can also be accessed by bus from La Spezia - either by the connecting Trail 4 from Biassa or as it passes through the town of Campiglia. For Biassa, bus 19 leaves almost hourly, and stops at Mercato North, among other stops (see the bus section). For Campiglia, it's bus 20 and it begins at Centrale FS train station and also stops at Mercato North. Note that beginning at Biassa or Campiglia allows a downhill round trip using the bus from Portovenere back to La Spezia! The best Cinque Terre map we could find. Click to enlarge, right click to save. For a wanderful, detailed look at the geography, drill down on this map of Europe: Reit- und Wanderkart. 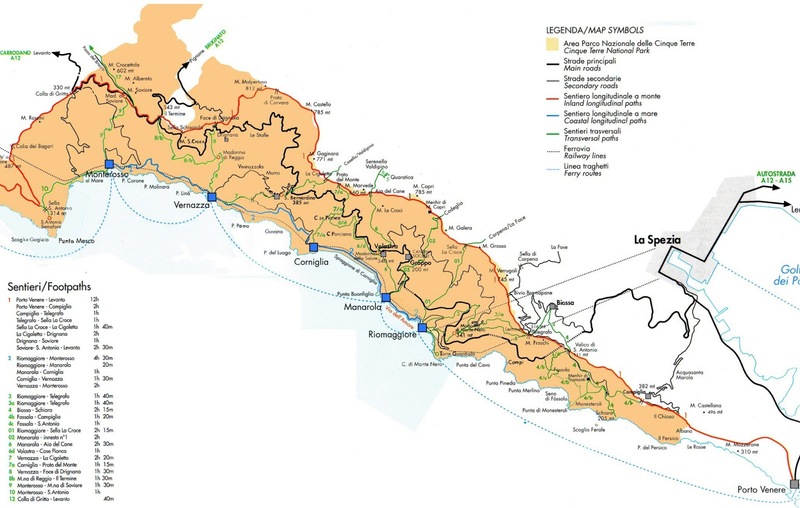 Also, before your hike look at the Parco Nationale delle Cinque Terre website for news and for a schematic trail map which will indicate closed trails. The estimated hiking time to Portovenere from Levanto is 12 hours, from Monterosso 11 hours, Vernazza 10 hours, Riomaggiore (the nearest train) is 4 hours, from Biassa 3 1/2 hours, and from Campiglia 2 hours. We have done the eating for you. Read about specialties of the area which includes Portovenere. Our story A Guide to the Local Food of La Spezia covers pesto, focaccia, croxetti, mescuia, vermentino, and more. Are you hungry yet? Where to Stay Use Booking.Com.Italy or Home Away.Italy for accommodation anywhere in Italy. Click on the Portovenere hotel name for more information and booking. Affittacamera La Darsena Darsena means wharf, and this B&B is right along the water in old Portovenere. Hotel Genio is just outside the ancient wall surrounding the old part of Portovenere. Grand Hotel Portovenere Recently renovated, the location overlooking the historic center cannot be better. Many rooms with sea views. Full service including free wifi. Parking on site is 20 Euro. Affittacamera La Lanterna This B&B is just a few minutes outside the old area, along the waterfront. Hotel Belvedere is well located and maybe the most popular choice. Hotel Paradiso is not far from the old town and closer to Portovenere's limited beaches. Hotel Royal Sporting is a pleasant 20 minute stroll along the waterfront is. This is nearer to beach facilities, and anyway you'll need the walk after what you will eat. Palmaria Hiking Information about hiking Palmaria Island just across the channel from Portovenere. Pro Loco Portovenere The local tourist association maintains a very informative site. Integrated Route Planner This interactive transport timetable from the Ligurian region will give integrated routes within and between Ligurian provinces using both trains and buses. It only works about a week ahead, but it is a very helpful resource. Also adapted for Mobile Devices. First, buy your Cinque Terre guidebook before you arrive as you won't easily find them in Italy. For a guidebook dedicated to Cinque Terre, the best by far is Pocket Cinque Terre Rick Steves (Amazon US) (Amazon UK) (Kindle UK). Most all of the Pocket Cinque Terre info is also included in Italy Rick Steves 2019 (Amazon US) (Amazon UK) (UK Kindle Store) which is Amazon’s best selling Italy guidebook. AutoEurope(US) Auto Europe(UK) or these links Booking.Com.Italy or Home Away.Italy for accommodation anywhere in Italy. * Portovenere or Porto Venere, it's your choice. The Romans and the Comune use the two word version. Most sources, including most Italian government entities uses the one word version. Send us a email if you hit a broken link or erroneous infomation.